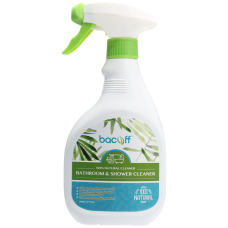 Bacoff offers best shower cleaning products that are 100% natural, eco-friendly. Kills germs & pathogens naturally. Easily eliminates soap scum, rust and water stains. Controls mould with regular use. Tough on bathroom dirt and stains. It's natural hand wash Is skin friendly, non toxic and environment friendly as well. Cleaning the bathroom does not have to be a strenuous and toxic affair. Bacoff™ Bathroom & Sho..